After a prolonged illness of liver problem, Asst. Sub-Inspector Yanglam Rangyang, a permanent resident of Tupi village break his last breathe at General Hospitl, Khonsa. The Khonsa Battalion Assam Rifles paid a befitting Tribute with full military honours to Late Naik Subedar Wanghian Lowang who died on 21st May,2018 due to heart stroke at District Hospital, Khonsa. Naik Subidar Wanghian Lowang was a part of surveillance operation in high altitude terrain in Riasi on 14th August, 2009 at around 16”45 hours, his team came under heavy automatic fire of terrorists from a dominating height. Displaying initiative of highest order, under automatic fire on own troops he retaliated and closed onto the terrorists by fire and move and killed one terrorist. 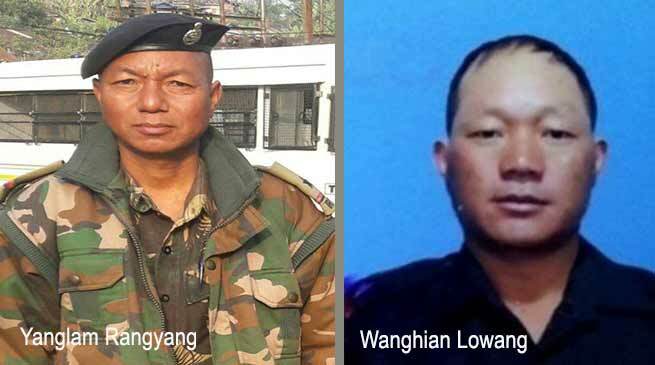 For his bravo act of conspicuous gallantry and action beyond the call of duty in the face of terrorists, Naik Subidar Wanghian Lowang was awarded Sena Medal (Gallantry). In a condolence message, All Tirap 4 elected representatives, Tirap Deputy Commissioner P.N. Thungon & Tirap SP Jitendra Kumar Meena, ZPC, CO and All Ranks of 6 Assam Regiment expressed their profound sorrow on sudden demise of young brave soldier and prayed for the eternal peace of the departed soul. The Moktowa village Chief Tewang Lowang, Gaon Buras, Panchayat members, bereaved family and relatives praised Khonsa Battalion Assam Rifles for showing helping hand towards the bereaved family in particular and civil society as a whole.